How many kilos of almonds did we pick this year? It’s a heap of almonds. A basketful. I read that the price of almonds has almost doubled from last year, to 9 euros a kilo. My grandson, Leo, who helps me pick them, can add to his savings account. Then I realize that the price is probably for shelled almonds. And, shelling them by hand is tedious, we can tell you. Leo and I spent a couple hours to get about 4 cups. The price is up because demand worldwide has increased and because California, which produces more than 80 percent of the crop, has suffered drought, reducing production. Spain, the world’s second producer of almonds, uses this nut so extensively that it has to import almonds. 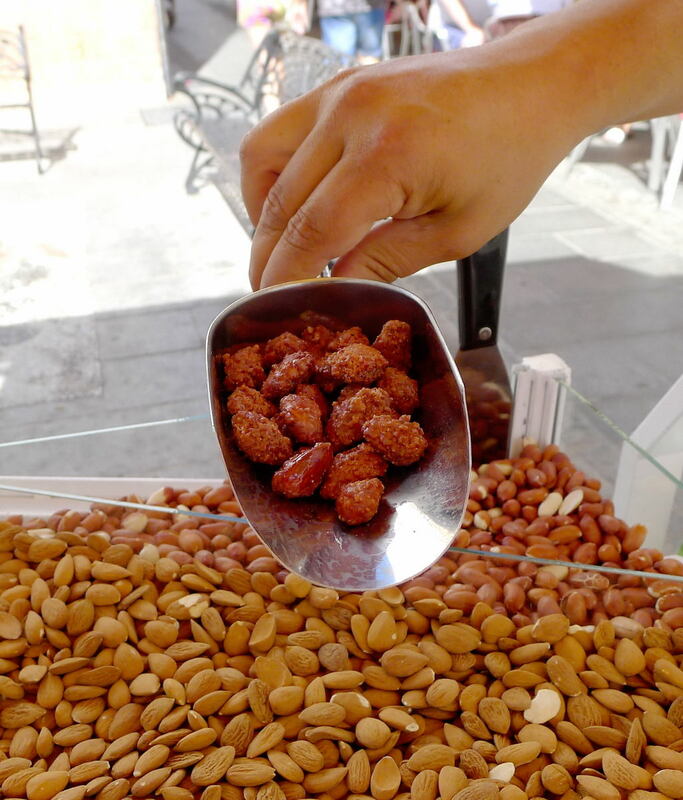 Growers are extending almond plantations, finding the crop more profitable than either citrus or olives. 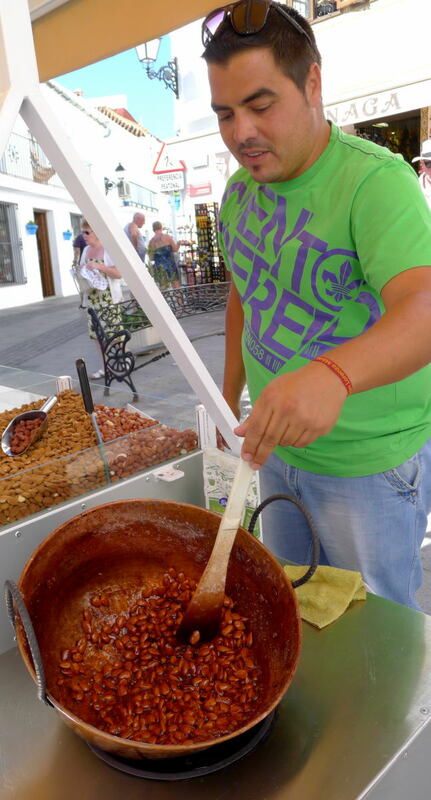 A vendor of candied almonds in the village plaza. 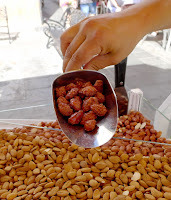 Today I am making garapiñadas, crunchy caramelized almonds. In the village where I live, they’re made at street stands. The vendor uses a round-bottomed copper pan, for good heat conduction. He adds a sprinkling of vanilla, which wafts a delicious aroma up and down the street and lures the customers. And, the important secret--he adds the sugar in three stages, so it caramelizes in layers, creating a thick and crunchy covering. He stirs almost constantly with a wooden paddle. Passing tourists are offered a free sample. 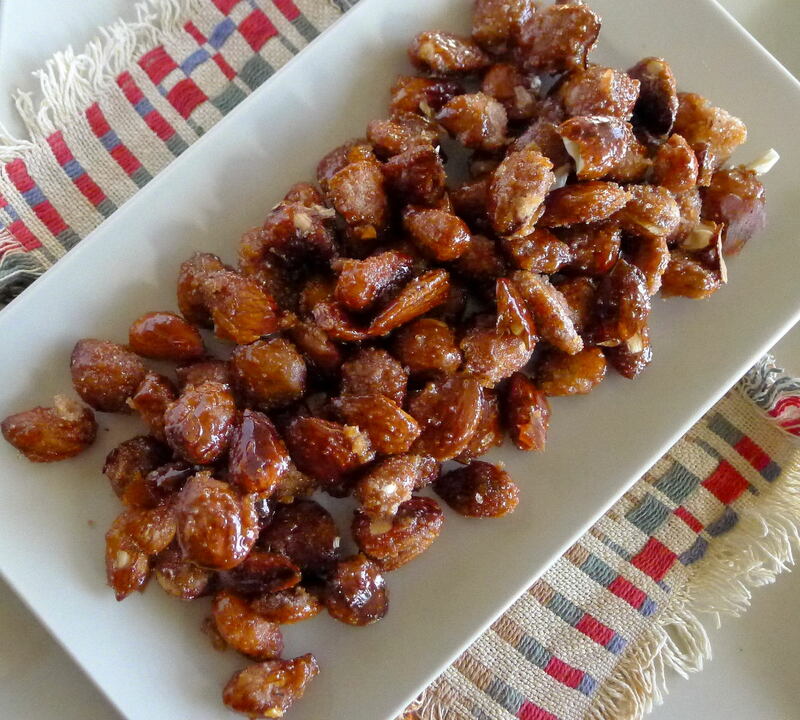 After that, they’re hooked, because these crunchy-sweet almonds are totally addictive. 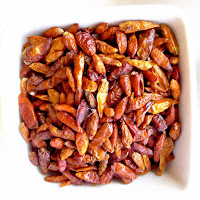 Makes 3 cups candied almonds. Divide the sugar in 3 parts. Almonds bubbling in sugar syrup. Put 1/3 cup sugar, the vanilla extract and all of the water in a heavy pan, preferably round-bottomed. Bring to a boil, stirring to dissolve the sugar. Add the almonds. Cook, stirring constantly, until the syrup thickens and begins to adhere to the almonds, about 3 minutes. Sprinkle with 1/3 cup sugar. Stir the almonds constantly until the sugar begins to melt and adhere to the almonds. Sprinkle with the remaining 1/3 cup of sugar. Continue stirring, just until the sugar coats the almonds. Remove from heat and turn the almonds out onto a baking sheet. The whole process takes about 5 minutes. When cool enough to handle, separate the almonds that are stuck together. 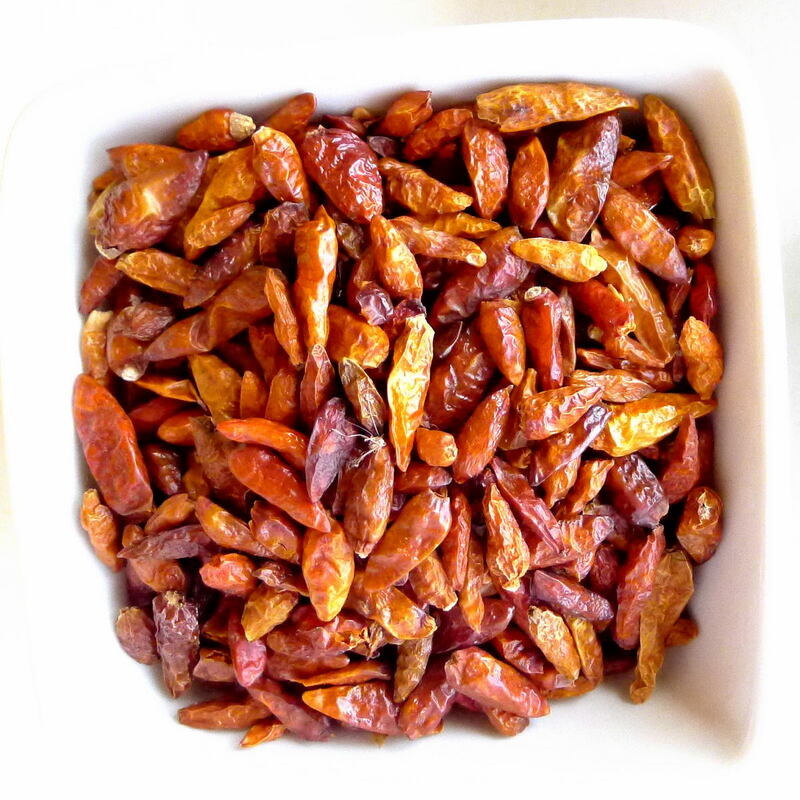 Here are links to more recipes using almonds. 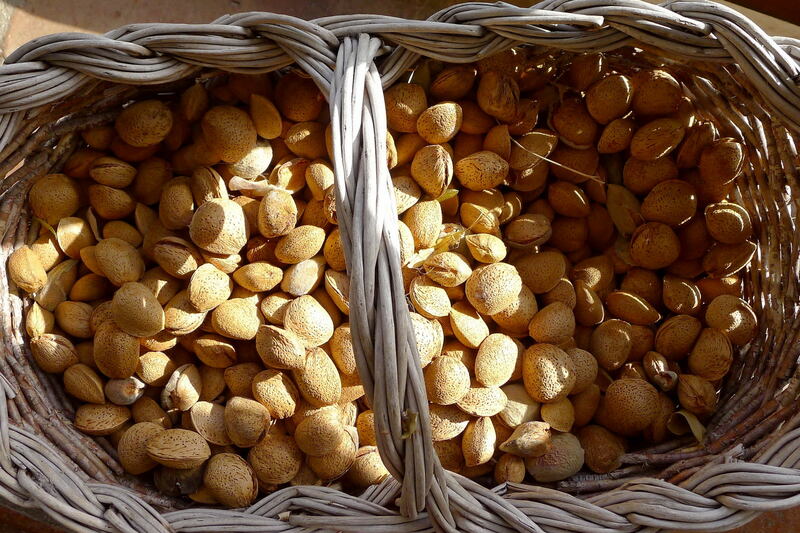 ALMOND PUFFS (Suspiros de Almendras). 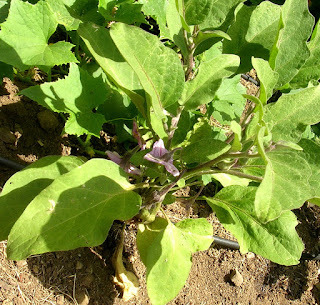 CARDOONS WITH ALMOND SAUCE (Cardos en Salsa de Almendras). CHICKEN IN ALMOND-SAFFRON SAUCE (Gallina en Pepitoria). Let’s push the restart button on summer. 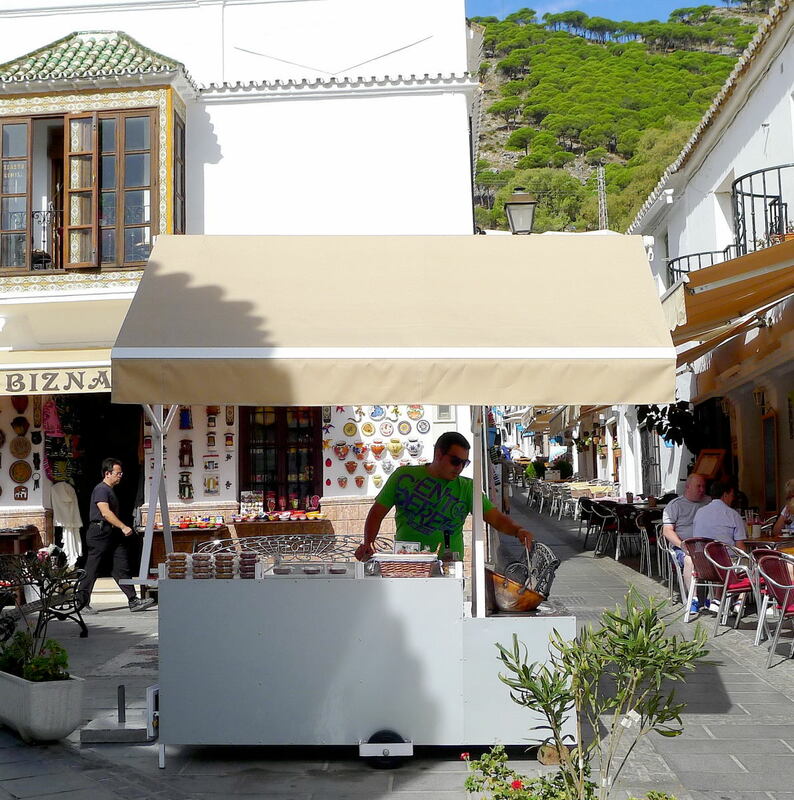 In southern Spain, we didn’t have summer, we had a preview of desertification—July temperatures were the highest on record and August almost as hot. Now that the weather has cooled somewhat, plants have revived. I’m picking eggplants, peppers and tomatoes and there are more to come. Now’s the time to enjoy those summer vegetables! 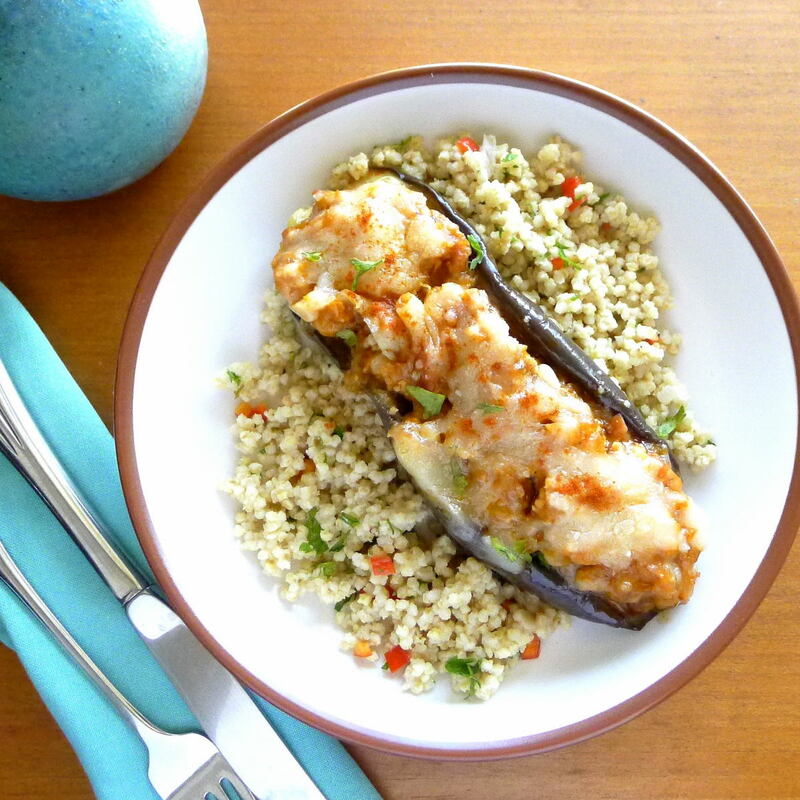 Here are recipes for stuffed eggplant and for fresh tomato sauce cooked in the oven. Eggplant shells are stuffed with meat and topped with grated cheese. You can use the ground meat of your choice—beef, pork, lamb, or chicken--for this tasty stuffed eggplant, spiced with freshly grated nutmeg. I prefer ground chicken thighs. With a salad on the side, it makes a light luncheon or supper dish. Cured Manchego cheese is best for topping the eggplant. Remove and discard stems and leaves from eggplants. Cut the eggplants in half lengthwise. Slash the flesh at 1 ½-inch intervals. 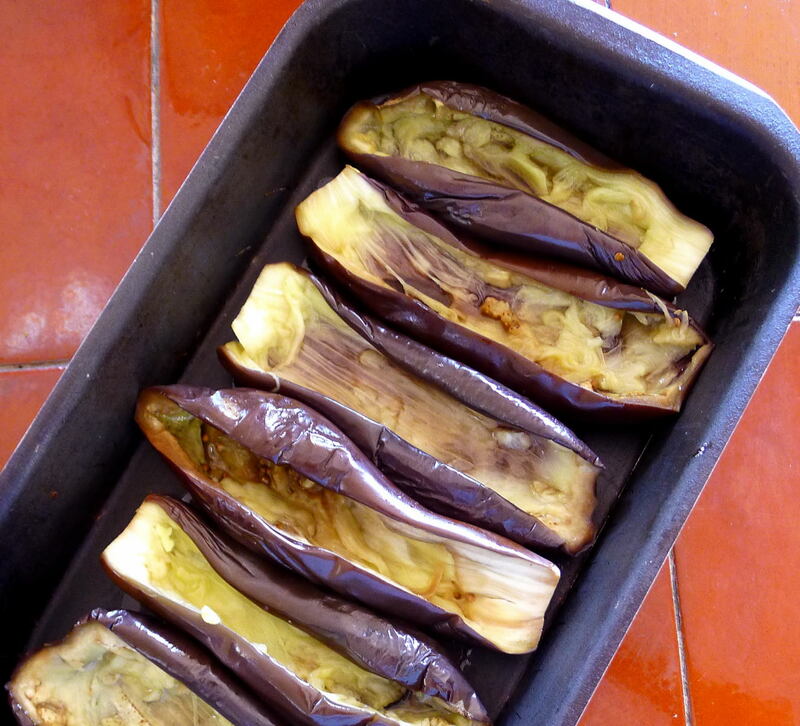 Place the eggplants in a single layer in an oven pan and brush with 2 tablespoons oil. Bake until fork-tender, about 20 minutes. Alternatively, place the eggplant halves cut-side down, two at a time, on a microwave-safe plate. Cover with plastic wrap. Microwave on high for about 4 minutes. Drain off accumulated juices. While eggplant is baking, heat remaining 1 tablespoon of oil in a large skillet and sauté the bacon 1 minute. Add the onion and garlic and fry 3 minutes. Add the cumin seed and the ground meat and continue frying on high heat, breaking up the meat, until it loses its red color, 2 to 3 minutes. Add salt, nutmeg, pepper, tomato sauce, and water. Bring to a boil, then reduce heat and simmer, covered, 20 minutes. When eggplant is cool enough to handle, scoop out the flesh and reserve the shells. Chop the flesh and add it to the meat in the skillet. Uncover the skillet and cook 5 minutes more or until most of liquid has cooked away. 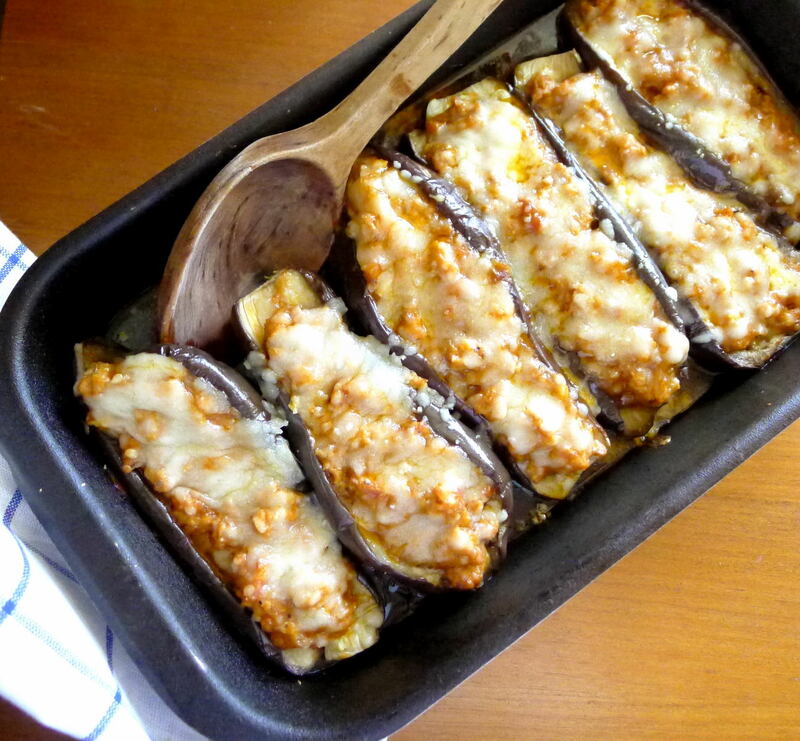 Arrange the eggplant shells in a single layer in baking pan. Spoon the meat filling into the shells. Top with the grated cheese. Sprinkle with pimentón. Add enough water to cover the bottom of the pan. Bake, uncovered, until cheese is melted and filling is bubbling, 15 minutes. Allow to stand 10 minutes before serving. Stuffed eggplant is served with millet pilaf (recipe here). Roast chopped fresh tomatoes to make sauce. While the oven was on to finish the stuffed eggplant, I roasted chopped tomatoes with olive oil, then pureed and sieved it to make a thick tomato sauce to serve with the eggplant. Use about 3 pounds of ripe tomatoes. Cut out the cores, slash the skin on the bottoms and either drop into boiling water or microwave on high until skins pull off easily. Allow to cool, then slip off the skins. Chop the tomatoes coarsely in a food processor. Spread 1/3 cup olive oil in a shallow baking pan. Add 1 cup chopped onions. Roast in a medium-hot oven (375ºF) until onions are slightly browned. Add all of the chopped tomatoes and 2 cloves garlic, lightly crushed. Sprinkle with 1 teaspoon salt, freshly ground black pepper. Add a bay leaf and any herbs—parsley, basil, oregano, celery. Bake the tomatoes, stirring occasionally, until they are thick, about 45 minutes. Let the tomatoes cool slightly. 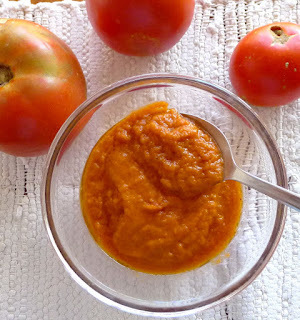 Remove the bay leaf and garlics, then puree the tomatoes in food processor or blender and put through a sieve. Serve the sauce hot, room temperature or cold. Hot stuff! 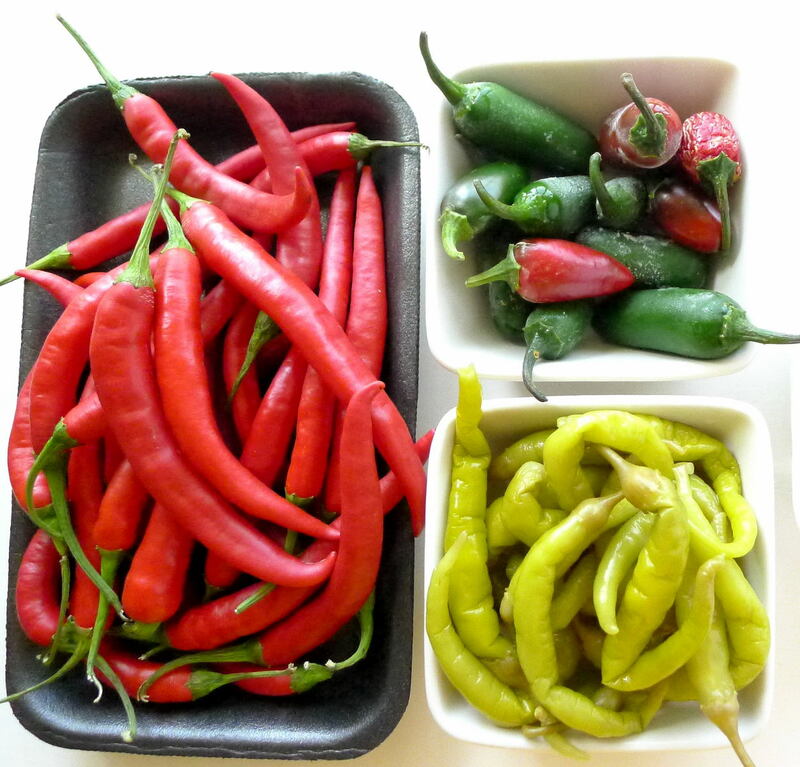 Several types of chile peppers. 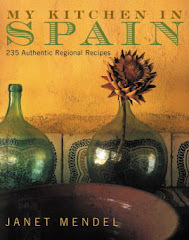 I’m always surprised to see renditions of Spanish recipes by Americans, both chefs and home cooks, that include chile peppers in one form or another—Mexican salsa, cayenne, jalapeños—whereas, in Spain, the chile is hardly used at all! It’s as if Americans have just gotta have the extra punch of spicy-hot. 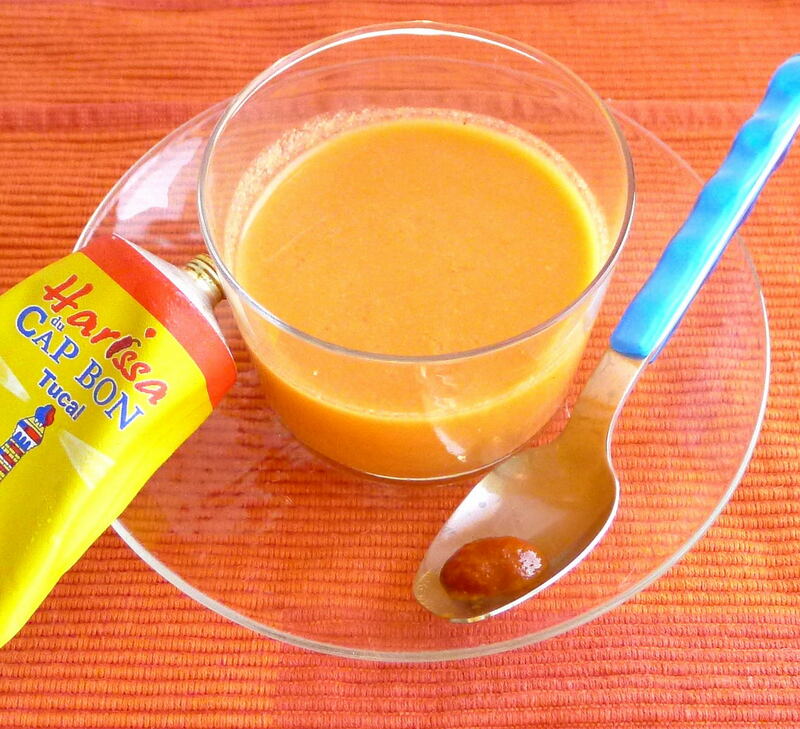 Oh, I recognize Russ’s gazpacho—best farmers market tomatoes, olive oil, bread as a thickener. Then he adds harissa, a hot chile paste. Harissa? Really? 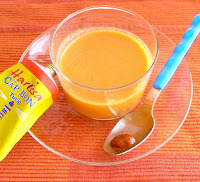 Gazpacho with harissa? Try it! Spain, of course, “discovered” the chile, capsicum pepper, in the New World and introduced it to the Old World. 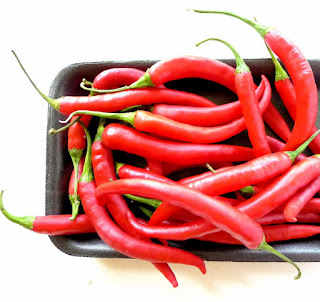 While the chile found its way into the cuisines of North Africa, India, Southeast Asia, China, in Spain it was the milder versions that left their mark—sweet pimentón (paprika), In Spain, “salsa” means any “sauce,” not the chile-spiked relish that accompanies Mexican-style foods. 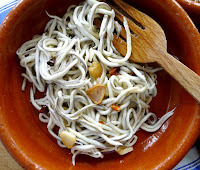 Baby eels with garlic and chile. 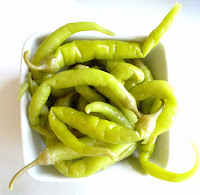 Guindillas also are the mild green pickled peppers that Basques serve alongside bean dishes or as an aperitif such as the Gilda (guindilla speared on a toothpick with olive and anchovy)..
Chile is essential in Spanish preparations such as snails, stewed tripe and the spice blend for pinchitos morunos, mini-kebabs with Moorish spices. And, truth be told, not much else. In my own kitchen, when I want spicy-hot foods, I cook Thai or Indian, maybe Mexican or creole. 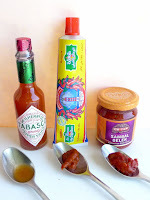 I keep prepared hot sauce on hand—Tabasco (made in Louisiana), harissa (this brand is made in Tunisia) and sambal oelek (Indonesian, although this brand comes from Holland). Harissa—I call it “Moroccan ketchup”—is really good squeezed on a burger. And, mixed into gazpacho too. 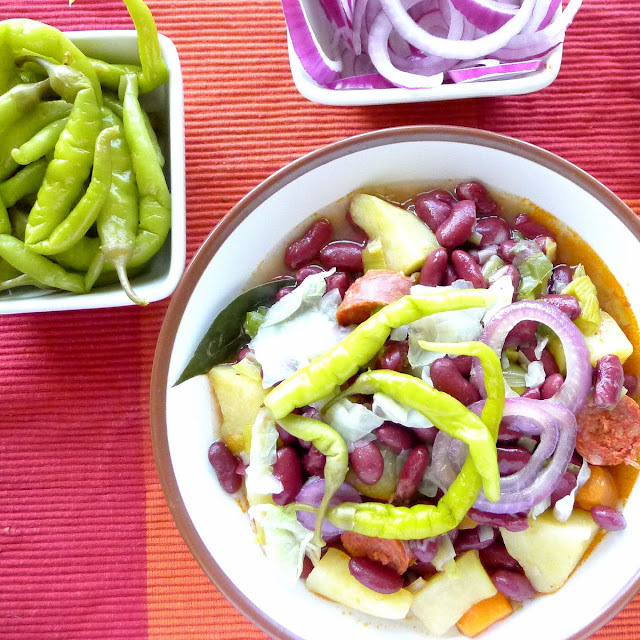 Red beans with chorizo and potatoes are garnished with pickled peppers. Basque cooks say you have to asustar the beans--give them a “scare” with cold water several times during cooking. It’s also important to make sure they always are covered with some liquid, so the skins don’t split. I cheated. 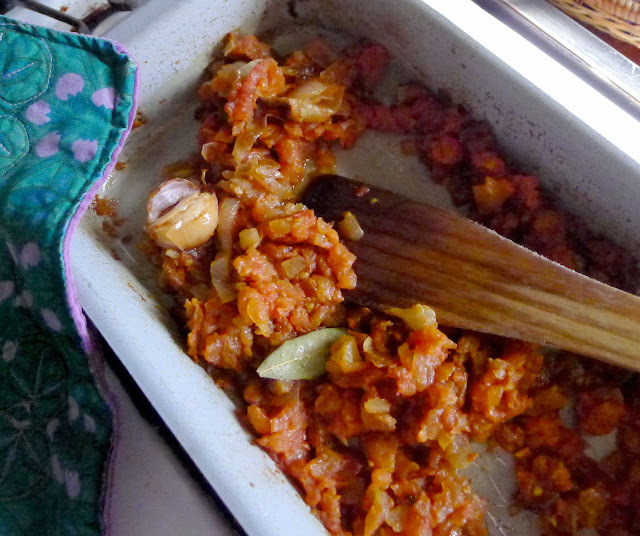 I cooked the potatoes, vegetables and chorizo in water, then added the contents of a jar of already-cooked beans. Put the beans in a soup pot and cover with 6 cups of water. Add the ham bone, if using, carrot, bay leaves, pepper and onion. Bring the water to a boil and add the oil. Reduce the heat to a simmer, cover the pot and cook for one hour. Add 1 cup cold water. Cook another 30 minutes. Add 1 cup cold water. Add the sliced leek, potatoes, salt and chorizo. Bring to a full boil, then reduce to a simmer and cook another 30 minutes, until potatoes are tender. 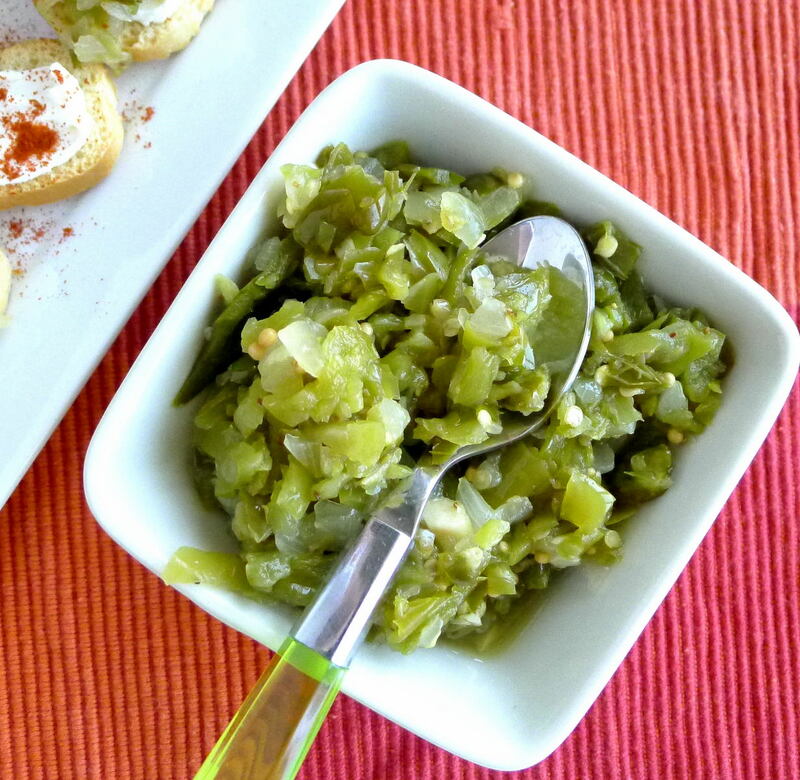 Serve the beans accompanied by cooked cabbage and onions, as desired, and pickled green chilies. 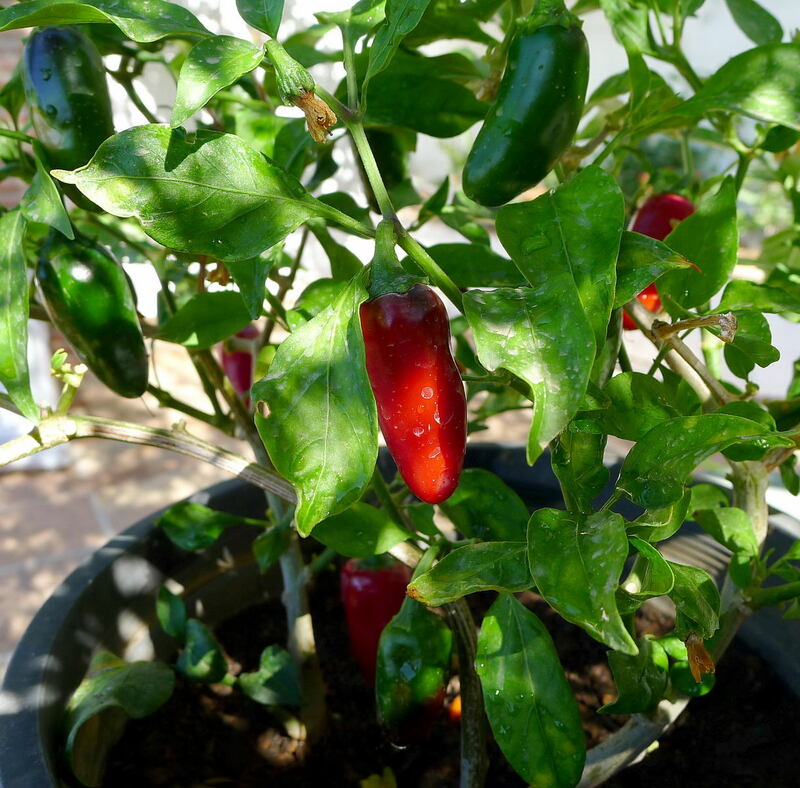 Jalapeño peppers, both green and red. Use rubber gloves to cut up chile peppers to avoid “burning” skin. 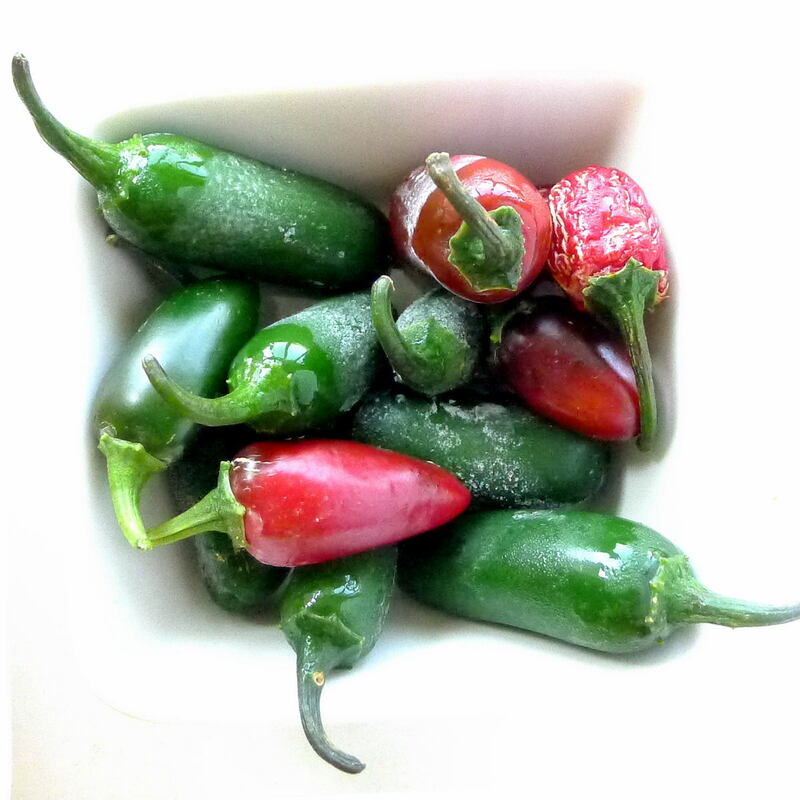 Remove stems and seeds from peppers and cut into chunks. Peel onions and garlic and coarsely chop onions. Grind peppers, onion and garlic in a food processor. Place the chopped vegetables in a heat-proof bowl and pour over enough boiling water to cover. Allow to soak for 10 minutes. Drain. Combine the vinegar, sugar, salt, mustard seeds and celery seeds in a pan. Bring to a boil. Add the pepper-onion mix and cook for 15 minutes. Ladle the relish into hot sterile jars and seal. 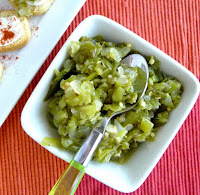 If relish is to be kept, process in a boiling-water bath for 15 minutes. Otherwise, allow to cool, then store the relish in the refrigerator. Keeps up to 2 months. 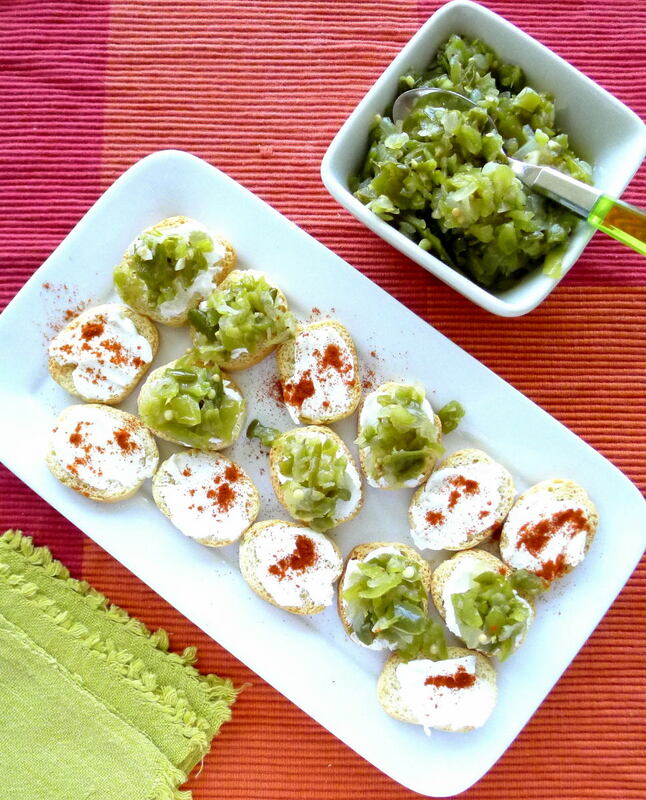 Spread cream cheese on mini-toasts, top with spoonful of green pepper relish. Sprinkle with pimentón picante (hot paprika). I'm not sure how I'll use those fresh red chiles. Maybe try a fermented hot sauce, or maybe thread them on string and let them dry. One year, I garlanded the Christmas tree with brilliant red chiles. 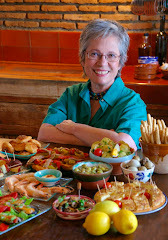 A few years ago, while gathering recipes for a cookbook, I spent the month of September traveling around La Mancha (central Spain). 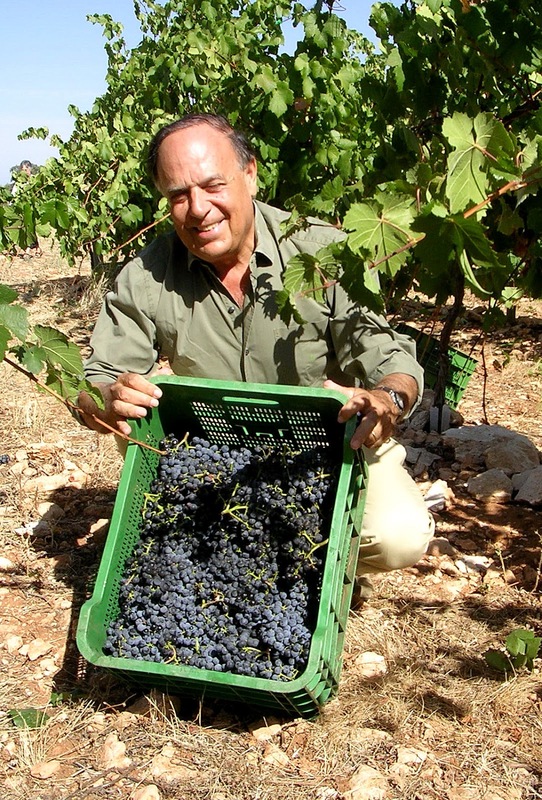 September is the month of the vendimia, the picking of wine grapes. Driving on secondary roads, everywhere in La Mancha we passed tractors towing wagons heaped with grapes, heading for the many bodegas, wineries, of the region. I picked grapes in the organic vineyards of Bodegas Dionisos in Valdepeñas (Ciudad Real) and watched the first pressing. In Malpica de Tajo (Toledo) I walked through the vineyards on the first day of the vendimia with Carlos Falcó, the Marqués of Griñón, who makes the extraordinary wines of Dominio de Valdepusa/, which have Vino de Pago denomination. At Los Hinojos (Cuenca), where the modernistic Finca Antigua bodega is located, I watched huge mechanical harvesters make their way through vineyards. La Mancha is big wine country. 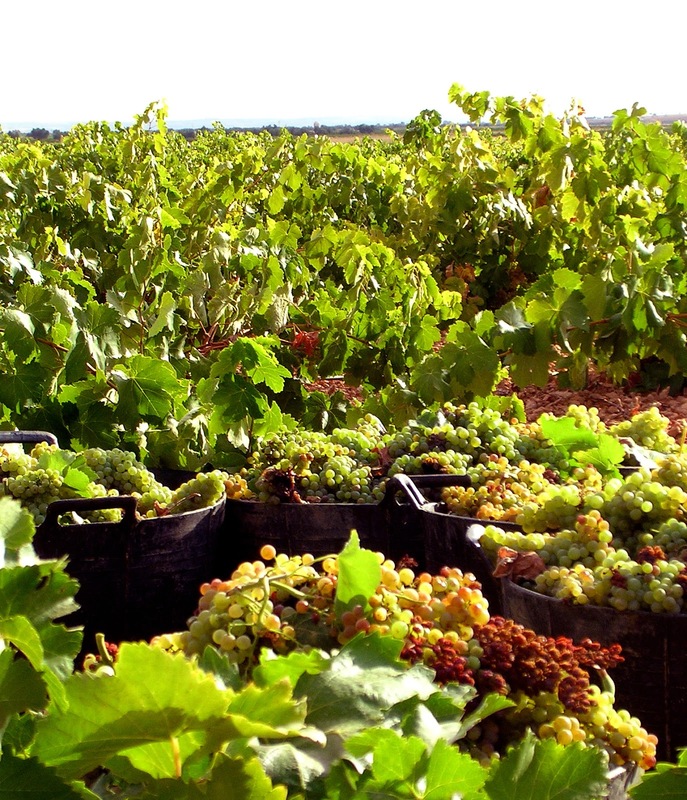 In fact, it is the biggest area of vineyards on earth—about eight percent of all lands worldwide planted in vines and almost half of all the vineyards in Spain are within La Mancha. Miles and miles of vineyards keep the landscape verdant through hot and arid summers. To celebrate vendimia month, of course I’m drinking wine. 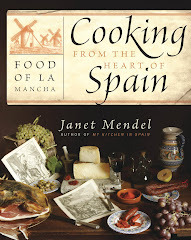 And I’ve also pulled a couple recipes from COOKING FROM THE HEART OF SPAIN—FOOD OF LA MANCHA (WilliamMorrow, 2006) that seem appropriate for the season. 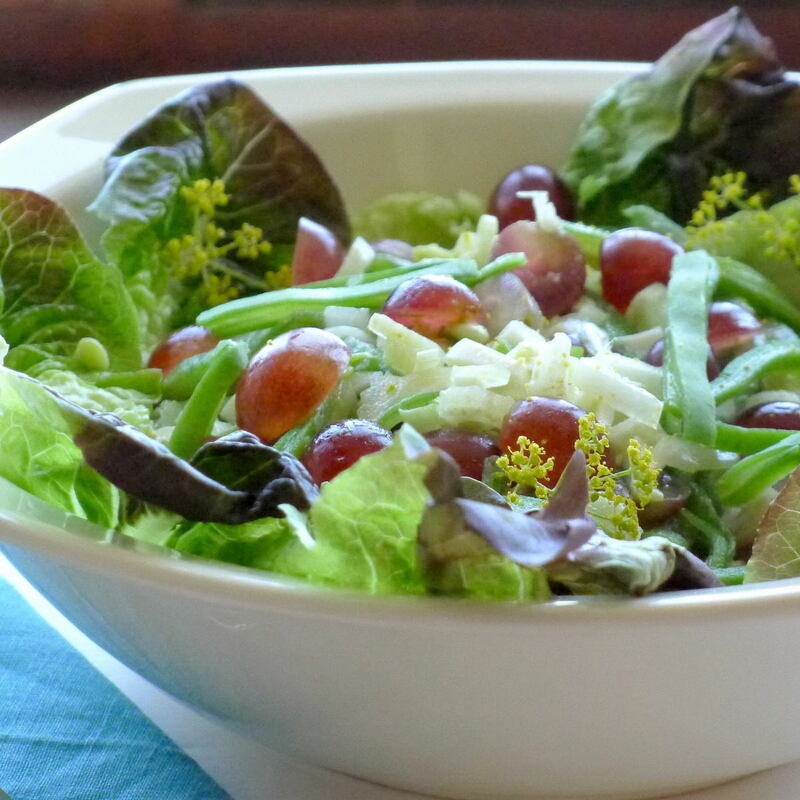 Green beans, grapes and anise--a grape-harvest salad. 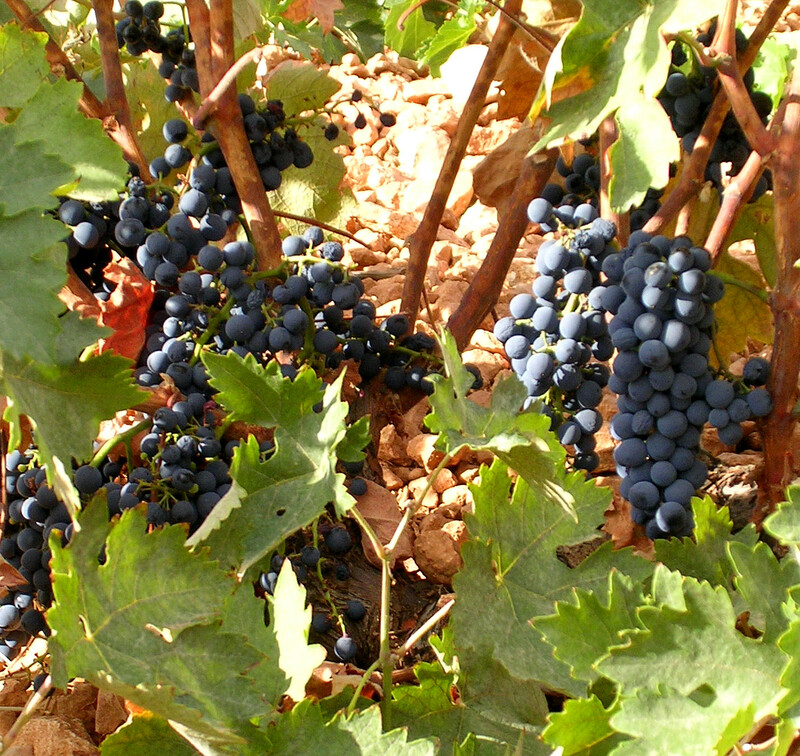 Wine is fermented grape juice. If the grape juice (or wine) is distilled, it turns into aguardiente, a clear, strong alcoholic beverage that is usually flavored with aniseed. In La Mancha it is customary to preserve fruits such as grapes and cherries in aguardiente, which becomes subtly infused with the fruit. In bars and restaurants you will see beautiful decanters and flasks of the liqueur with fruit. It is served into tiny glasses as a digestive. The fruit can be drained and served separately. 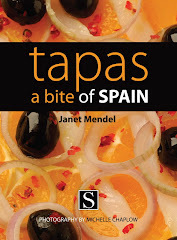 This salad, incorporating grapes macerated briefly in aguardiente, was inspired by a recipe in a little book, La Cocina Tradicional en la Provincia de Toledo, prepared by a chef at the national parador of Oropesa (Toledo). Paradors are a national network of hotels, often situated in monumental castles, monasteries, and ancestral palaces. In the original recipe, the salad is served alongside sautéed scallops of venison. 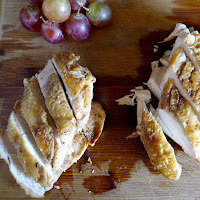 It’s equally good with chicken breast (see following recipe) or lamb. Use wine grapes, if available. Otherwise, use red grapes. Add the dressing to the beans immediately before serving, so the vinegar doesn’t leach the bright green from the beans. Place the halved grapes in a small bowl and add the aguardiente or anisette. Allow to macerate for 2 hours. Drain the grapes and discard (or drink) the aguardiente. 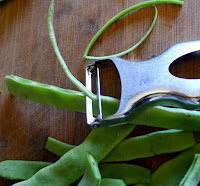 Slice off edges of beans. Cut off tops and tails of beans and either sliver them lengthwise or cut crosswise into 2-inch pieces. 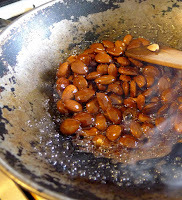 Cook the beans in boiling, salted water until crisp-tender (3 minutes from the time the water returns to a boil). Drain and refresh in cold water. Drain. Place the beans in a bowl and add the celery or fennel, scallions, and grapes. Cut the egg in half. Remove yolk to a small bowl. Dice the white into the bowl with the beans. Mash the yolk with the garlic, mustard, vinegar, oil, and salt. Stir the dressing well. Immediately before serving, toss the dressing with the beans. Garnish serving bowl with red lettuce or, alternatively, divide salad between 4 individual serving dishes, garnishing each with a few lettuce leaves. If desired, sprinkle the salad with fennel pollen. 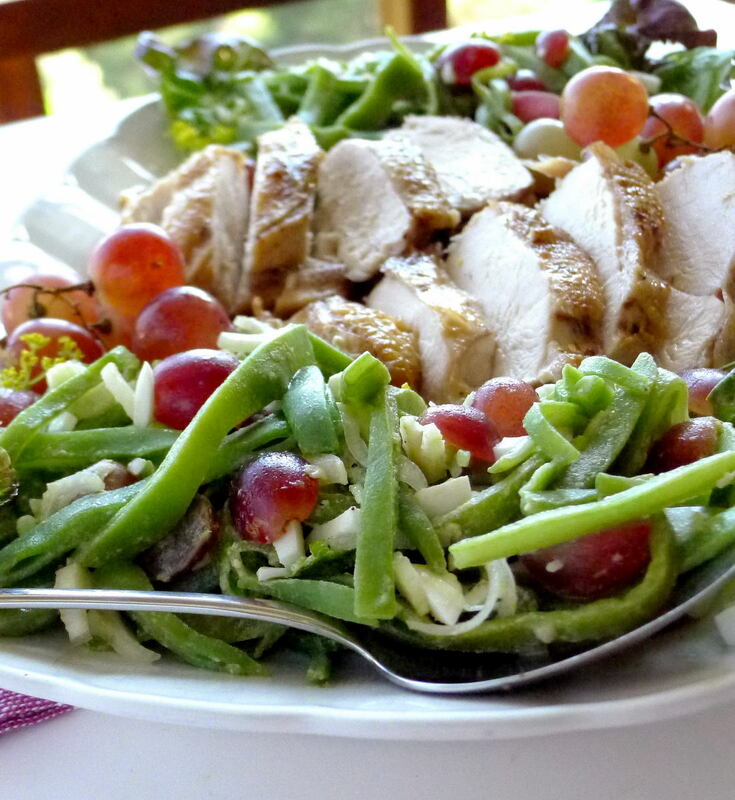 Serve bean and grape salad as a side with chicken breasts. Chicken breast simmers with wine, spices and anise brandy. Aguardiente de anís is a clear, anise-flavored grape brandy, sweet or dry, much appreciated throughout Spain. It makes a pleasant digestive after a meal, served neat in a snifter or over ice. 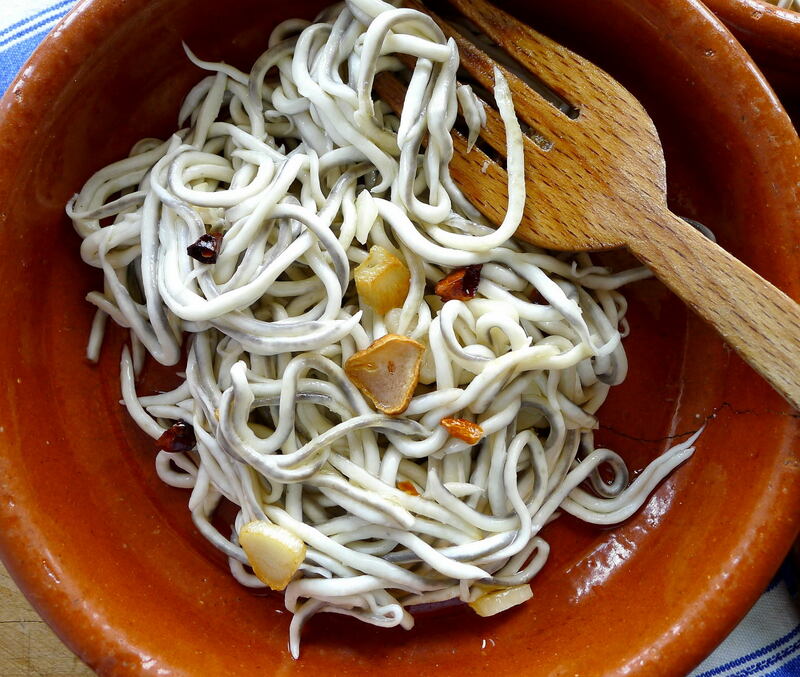 Hardy peasants might sip it for breakfast, when it’s said to matar el gusanillo, kill the little “worm” of hunger. 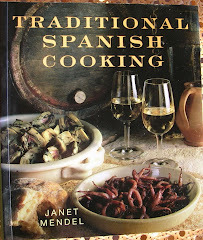 For this recipe use dry aguardiente. I liked the subtle flavor aguardiente gives to this sauce so much, that I’ve since experimented with it in other recipes. 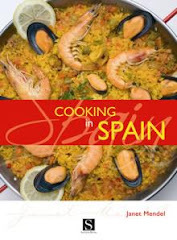 It’s really good added to mussels marinera, with tomato, garlic and white wine. Sprinkle the chicken breasts with salt and pepper and set aside 15 minutes. Heat the oil in a large skillet or sauté pan. Add the chicken breasts and brown them on medium heat, about 5 minutes. Turn the chicken and add the garlic. Sauté until chicken is lightly browned. Sprinkle the thyme, cinnamon, cloves, nutmeg and coriander over the chicken. Add the anisette, wine, and water. Cover and simmer 10 minutes. Turn the chicken pieces. 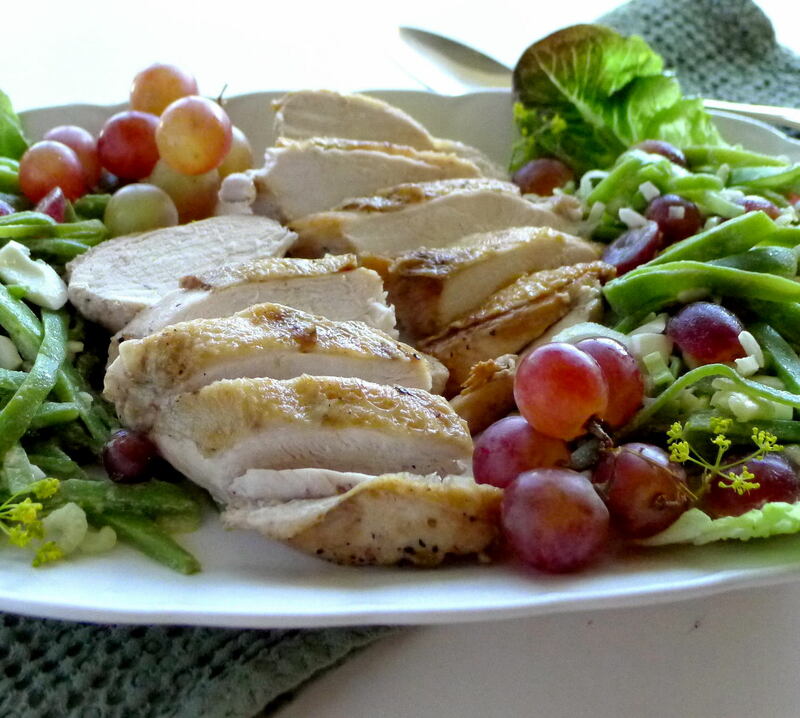 Cook until chicken is tender, 10 to 15 minutes longer, depending on thickness of pieces. Remove the chicken breasts to a cutting board and allow to rest 5 minutes. Slice the chicken. Discard the whole spices and serve the sauce remaining in the pan with the sliced chicken. 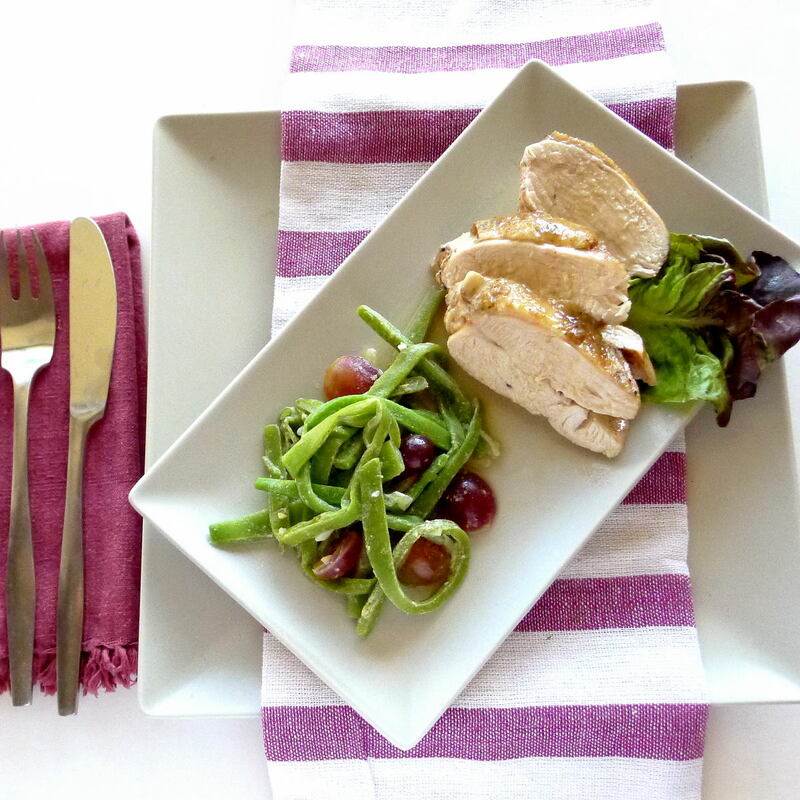 Bean and grape salad complements the anise-flavored chicken breast.